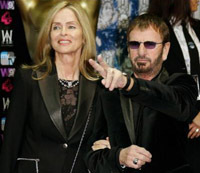 Today Hollywood embedded one more star - Richard Starkey Jr.aka (Ringo Star) with his trademark rings on his fingers his Bond girl by his side and with a Little help from My Friends which includes John, George in spirit, Ringo got his star… at last. That only leaves Sir Paul that has not received his star on the Walk Of Fame in Hollywood. The capital record building home of Elvis, and the Beatles was all lit up for the unveiling of Ringo's star, thousands appeared to honor the mop top. Ringo was the best in Hard Day’s Night and The Magic Christian films. Richard Starkey Jr., MBE (born 7 July 1940), better known by his stage name Ringo Starr, is an English musician, singer-songwriter, and actor who gained worldwide fame as the drummer for the rock group The Beatles. When the band formed in 1960, Starr belonged to another Liverpool band, Rory Storm and the Hurricanes. He became The Beatles’ drummer in 1962, taking over from Pete Best. In addition to his contribution as drummer, Starr featured as lead singer on a number of successful Beatles songs (in particular, “With a Little Help from My Friends“, “Yellow Submarine“, and the Beatles version of “Act Naturally“) and as songwriter with the songs “Don’t Pass Me By” and “Octopus’s Garden“. Hollywood Today has contributed to the report.